2013 Bloomington, MN Coming Soon! 2009 Fort Lauderdale, FL 59 teams head down for some fun down by the shore as the NACBA Committee hosts once again. Seattle cuts the nets down as they grab their fifth Mens title, slipping by the Chicago Dragons. The SF ArcAngels dominate the Women's Open division. The NY USAB 18's make it 5 consecutive Junior Championships, as they defeat the NY ISS Flights. In the 15's, Toronto CCYAA Youth goes undefeated to win their first title. NY USAB Girls win the Liberty. Toronto CCYAA Seniors complete the threepeat in the 35+ division, as they get by the NJ Pirates. In the Mens Friendship, it's an all-Suns finals with the Philly Suns C besting the Philly Suns B. 2008 Philadelphia, PA 77 teams head to the City of Brotherly Love, as Philadelphia hosts the NACBAIT for the 3rd time. The Seattle Bladerunners make a triumphiant debut in the first ever Mens Elite division as they defeat Arizona Desert Jade on a last second free throw. In the Mens Open, SF CCU downs the Montreal Kaitas. The Toronto Sliders bomb their way to the Friendship title, Toronto CCYAA Sr. repeats in the Senior 35's, and the NY Fishmen grab the Master 45's trophy. In the Womens Open, the SF ArcAngels battle past the CCYAA women, while the Toronto Black Koi take the Liberty. NY USAB 18's do a 4-peat in the Boys Junior 18's, and USAB also earns the repeat chip in the Youth 15's division. Other tourney highlights include a gigantic Welcome BBQ, the NACBA Free Throw contest, the Papa John's 3-Point Shooutout, Tournament Scholarships, and the NACBA Top 10 Women's awards. 2007 Philadelphia, PA With the Juniors divisions unable to travel to the Wild Wild West, the Junior NACBAIT was held in Philly. Like clockwork, NY USAB 18 beats Toronto CCYAA 18 in the Final game. In the 15's championships, NY USAB 15's pull it out against the NY Rockits. In the Video Game National Championships, Toronto CCYAA takes the 15/under title, while Washington CYC brings home the giftcard in the 18/unders. Thank you to the Philadelphia Suns for hosting this fantastic event. 2007 Mesa, AZ Another new location, as the NACBA Executive Committee takes us to Arizona. 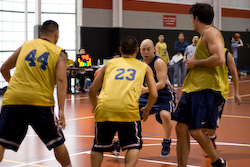 NY USAB Gold surprises the field to win the Mens Open as the come from behind against the Chicago Dragons. LA Aiya re-enters the winner's circle as they defeat the SF Red Coach in the Women's Championship. The SF Wildcats dominate the Friendship division in unheard of fashion from their first game until their last, as they beat Montreal MMAC Mars in the Finals. The Philly Lady Suns make a huge 10 point comeback to take home the Liberty. 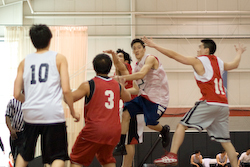 Toronto CCYAA Sr. returns to form as they take the Seniors. 2006 Boston, MA The Boston Knights host 66 teams and give out free Spaldings to everyone. It's a broken record in the Mens Open, as Seattle defeats the SF Duke. Toronto CCYAA upsets SF Red Coach in the Womens Open. The NJ Pirates beat the hometown Knights Sr in the 35 & Over Finals. NY MO Warriors 18's beat Toronto CCYAA 18 once again in their finals matchup. The NY Rockits Alumni slips by the SF Wildcats in the Friendship. NY Sabres Blue wins the Liberty. 2005 Chicago, IL We return to our roots. Much thanks to Mr. Gene Lee and the Chicago Dragons. Seattle Bladerunnes recapture the Mens Open, as they upend the SF Duke. SF Red Coach wins the Womens Open in their first appearance as they dethrone LA Aiya. The NY Fishmen visit the fountain of youth, as they win the Friendship over Washington CYC B. Toronto CCYAA Sr. edges out the Chicago DNC in the Senior division. NY USAB 18's take their first 18 & U chip, defeating the 2004 winner Toronto CCYAA 18. Seattle Shibooyah bests the Philly Lady Suns in the Liberty. 25 years and counting. 2004 Montreal, QC Free duffle bags from the Montreal MMAC. Boston Hurricanes AAU becomes the first East Coast team to win the Men's Open NACBAIT, as they defeat Washington CYC A in an east coast showdown. LA Aiya gets the repeat in the Women's, as they beat the Toronto Dragons. Toronto CCYAA Seniors defeat the NY Fishmen in the Seniors. Toronto CCYAA 18's defeats the Washington CYC 18's in the Juniors. NY Crossbearers take the Friendship. 2003 Las Vegas, NV The first Tournament that there was not a designated host team, the NACBA member organizations worked together to pull off this group collaboration. Seattle Bladerunners upsets LA Alpine in the Men's Finals. LA Aiya gets revenge on the SF ArcAngels in the Women's. NY Young Life Rockits get the best of the Washington CYC 18's. SF Saints make a return, this time in the Seniors Division- where they defeat the Chicago Dragons Seniors in the Finals. SF Freemasons take the title in the first ever Friendship Division Championship. 2002 Washington, DC First time to the Nation's capital. LA Alpine beats the host, Washington CYC A in the Finals. SF ArcAngels dethrones LA Aiya. Philly Suns Senior show they still have game. SF Hoopsters repeat in the Juniors. 2001 Boston, MA LA Alpine defeats the NY Rockits AIA. LA Aiya comes in to take over the Women's Division. NJ Pirates defeat the Boston Knights Seniors again. SF Hoopsters crush the Juniors competition. Budweiser at the banquet. 2000 Toronto, ON CCYAA plays host. The NY Cobras are the first Big Apple team in the Men's Open Finals. LA wins. SF Dragons defeat the Washington CYC China Dolls in the Women's Open. NJ Pirates beat the Boston Knights Seniors. Toronto CCYAA 18's repeat. 1999 New Jersey, NJ Seton Hall. LA Alpine R&K Little Horse defeats the Saints. Washington CYC China Dolls win the first Women's Open Championship. NY Titans defeat the NY Rockits to win the first Seniors title. Toronto CCYAA defeats the NY Cruisers for the Junior title. 1998 Philadephia, PA SF Saints recapture the crown. In Junior action, the NY Cruisers defeat the NY Young Life Rockits. 1997 San Francisco, CA Only 8 teams in the Men's Open. LA beats the SF Duke. 1996 Boston, MA The Knights host. LA defeats Chicago. Junior Division arrives with a bang as the NY Young Life Rockits capture the inaugural title. 1995 Toronto, ON North of the Border again. SF Saints win. 1993 New York, NY LA Alpine beats the SF Saints. 1992 Los Angeles, CA LA Mixers beat the Saints. 1991 Boston, MA Not quite Spy vs. Spy, but we ended up Saints v/s Saints instead. SF Saints White defeats the SF Saints Red. 10 of 11 for the SF Saints. 1990 San Francisco, CA We move out to the West Coast. SF Saints defeat LA Alpine R&K Little Horse. 1989 Philadelphia, PA First time to the City of Brotherly Love. An all Frisco Final- Saints v/s Blazers. Saints reclaim the title. 1988 Montreal, QC The Tournament moves to Canada, and the NACBAIT finally has a new Champ- LA beats the Saints. 1987 Chicago, IL SF over LA. Again. Seven. 1986 Boston, MA Saints again. This time they defeat LA Alpine R&K Little Horse. 1985 New York, NY The Philadelphia Suns reach the Championship before losing to the Saints. That made it 5 and running, in case anyone is counting. 1984 Boston, MA The NACBAIT moves to Boston, as the Boston Knights host the event. SF Saints defeat the Hawaii Islands again. 1983 Chicago, IL The SF Saints defeat the host team, the Chicago Dragons in the Finals. 1982 Chicago, IL Deja vu. Same place. Same teams in the finals. Same result. SF Saints defeat the Hawaii Islands in the Championship. 1981 Chicago, IL Someone finally came up with the idea of a National Tournament for Chinese hoops addicts. 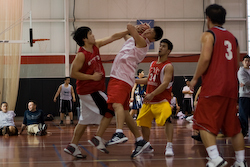 The Chicago Dragons host the first ever North American Chinese Basketball Association Invitational Tournament. SF Saints defeat the Hawaii Islands in the Championship.